KPTCL JE Syllabus PDF and KPTCL JE Exam Pattern 2019 are now available here to download for a free of cost. Therefore, the candidates who are looking for KPTCL AE JE Syllabus can get it from this page. Also, check the KPTCL AE Exam Pattern in the below sections. Visit our website recruitment daily to get the latest updates regarding all Government Jobs Notifications, Syllabus, Previous Papers, etc. Aspirants who are really interested in this job should start their preparation from now by following KPTCL Syllabus, KPTCL Exam Pattern, KPTCL Recruitment Notification, KPTCL Recruitment 2019 Notification, KPTCL Previous Year question Papers and KPTC Admit Card in other sections of our website. Candidates appearing for KPTCL Examination should be aware of the recruitment notification before starting the preparation. Once the official notification is released we will notify for the candidates who have already subscribed to our website. For more regular updates stay tuned to our site. Karnataka Power Transmission Corporation Limited (KPTCL) has recently released notification for hiring talented and dedicated candidates to the Posts of Assistant Engineer (AE), Junior Engineer (JE), Assistant Executive Engineer (AEE), Junior Assistant (JA), etc. in KPTCL and ESCOM’s. Therefore, this KPTCL AE Notification 2019 is a great opportunity for all the aspirants who are eagerly waiting for KPTCL AE Jobs in Karnataka. Hence, interested individuals can apply for this KPTCL JE Recruitment before the last date. To perform well and qualify the KPTCL AE JE Exam 2019, download KPTCL AE Syllabus & KPTCL JE Exam Pattern 2018-19 from below and prepare according to that KPTCL JE Syllabus. Candidates who have applied for KPTCL AE Jobs are searching for KPTCL AE Syllabus in various websites, but they are failing to get exact ESCOM’s Syllabus & KPTCL JE Exam Pattern. Hence, for helping those individuals, we have provided the same KPTCL JE Syllabus and KPTCL AE Syllabus and Exam Pattern as given in the Official Notification. Therefore, download KPTCL AE Syllabus & Exam Pattern from our website. Check KPTCL Bengaluru Karnataka Exam Pattern to know the marks allotted for each subject, exam type, no. of questions asked from each topic of KPTCL AE JE Recruitment 2019, etc. Therefore, work hard and grab to chance to work in KPTCL Mysore Karnataka. In JE & AE Exam Paper, there will be objective type questions from Civil/Electrical & Electronics for 75 marks and General Awareness topics for 25 marks. The KPTCL AEE Paper consists of questions from Electrical & Electronics and General Awareness & Aptitude. The EE topics are for 75 marks and the General Awareness Subjects is for 25 marks. In KPTCL Junior Assistant Test Paper there will be multiple choice questions from Computer Literacy, English/ Kannada, and General Awareness & Aptitude. Check above table for topic wise marks for KPTCL AE JE Recruitment 2018. Also, Check Other Government Jobs Previous Year Question Papers here. The KPTCL AAO Exam consists of questions from Finance and General Awareness & Aptitude. Finance is for 75 marks and General Awareness & Aptitude is for 25 marks. The complete and detailed KPTCL AE JE Syllabus for all Posts is as follows. UThe utilization of Electrical Energy. Finally, here we enclose KPTCL Syllabus. So, contenders can make use of KPTCL Previous Question Papers while preparing for the KPTCL Exam. Also, keep Searching our site Recruitment Hunt for more Government Job updates. 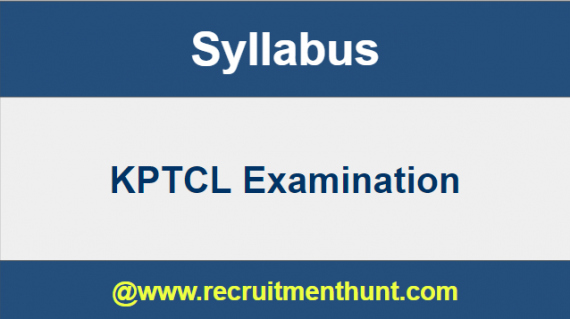 Also, interested individuals can download the KPTCL Exam Syllabus and KPTCL Exam Pattern 2019 here. Also, For more Job updates do subscribe to our site Recruitment Hunt.